The Confirmation process begins during Middle School with 7th and 8th graders participating in monthly trips to sites significant for their religious, cultural, or service oriented foci. These practical trips prepare them for deeper conversations and lessons beginning in the 9th grade. 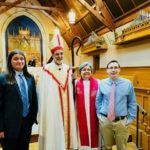 Confirmations are held at the Cathedral in Newark in the Spring and our classes will join the youth and adults of other churches in a large celebration. Preparing adults for Confirmation or Reception is is done during a series of discussions.